In the depiction of precious materials as the richly brocaded antependium of the altar, the delicately carved gothic shrine and the draperies of robes and curtain with subtly nuanced shades and fine golden highlights suggesting the play of light, the artist reveals himself as a committed adept of Flemish tradition. 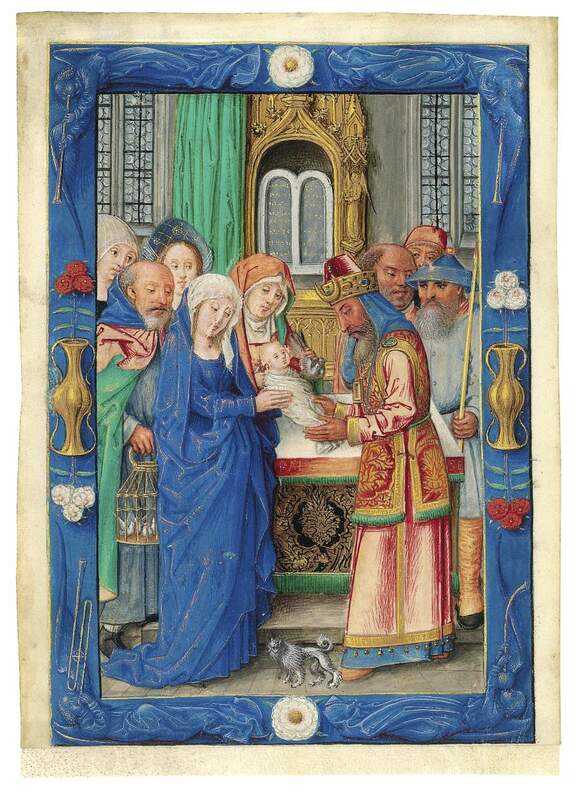 The miniature was thus attributed to a Flemish painter, until recent research attributed this fine miniature to the successful workshop of Hans Pleydenwurff (c. 1420-1472) and Michael Wolgemut (1434-1519). Wolgemut married Hans’ widow and ran the shop since 1473 with the support of Pleydenwurff’s son Wilhelm (d. 1494). Both were excellent designers of book illustrations, as is seen in their woodcuts, e.g. of the famous Nuremberg chronicle. At least Wilhelm Wolgemut is also documented to have worked as an illuminator. This leaf may have been intended to be an independent devotional painting. Examples of such small-scale paintings are well known.